Storm Protection | Overhead Garage Doors by Doorways, Inc.
Our custom built colonial shutters are patterned after original wooden shutters. They are avialable in louvered or board and batten styles. All styles are manufactured of powder coated aluminum to ensure strength and lasting beauty. 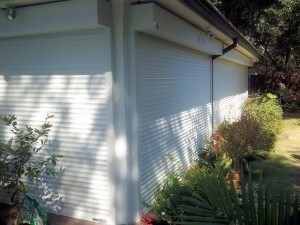 These shutters enhance the architecture of the home while protecting against violent weather. Additional colors are available for an upcharge and can be found here. *Please note these colors are reference examples only and actual product color may differ slightly. 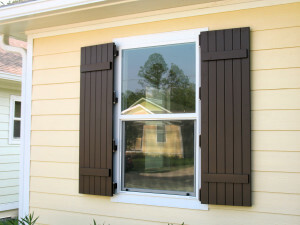 Bahaman or Bermuda shutters are manufactured in the same manner as the Colonial shutters, from powder coated aluminum. These shutters allow visibility from inside while shading the window from the outside. Bahama shutters open and close in seconds and are virtually maintenance free. 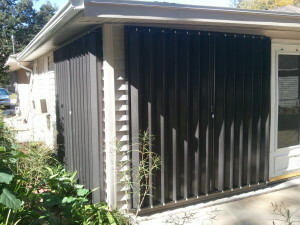 Roll-up shutters can be manual or electric and offer security, privacy and protection. 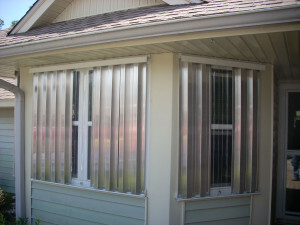 Many customers use roll-ups to block out the sun, for privacy and of course for storm protection. Rollup shutters are available in white, bronze, ivory and beige. The Accordion shutter is available in a variety of ratings, depending on the need of the customer. 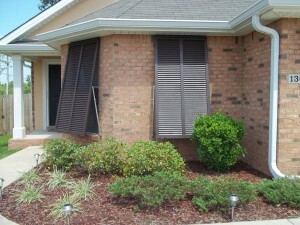 These shutters are used for security as well as storm protection. Accordion shutters are Permanently installed on the house; therefore no storage space is needed. Storm panels are the most economical form of hurricane protection and are stackable to minimize storage space. We offer aluminum .050 Hurricane Storm Panels and galvanized steel. Dade rated panels provide protection, value and peace of mind. Also available in clear Lexan panels. Mix and match the panels to allow light to filter into each window or add one Lexan panel per room. The Garage Door is the Largest Opening On Your Home. Protect your home and family from hurricane-force winds with our Windloaded Garage Doors. Don’t need a new garage door? No problem, we can retrofit most existing garage doors with a Windload Kit. 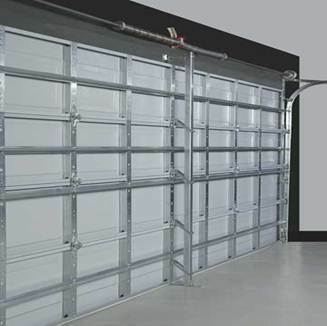 By adding horizontal re-enforcement struts to the back of the door on at least 2 of the sections and installing brackets to support a vertical windpost an existing garage door can be made to withstand higher windspeeds. Larger doors usually require more than one post depending on the size and type of door.